tenth largest emitter of CO2 after 48 hours. station, and cut the power plant off from all coal supplies for 24 hours. Vattenfall lowered the power plant’s capacity by 80 percent. 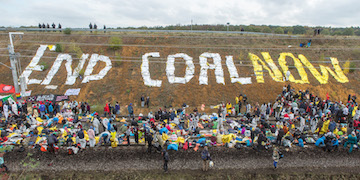 Ende Gelände is part of an international wave of actions called Break Free from fossil fuels. Over the past two weeks, thousands of people resisted fossil fuel projects on six continents.